Deonte Taylor, left, and Austin Schmit. When a lion cub stalks a fallen tree branch, it’s actually honing skills it will need to become an efficacious hunter. When two puppies wrestle, they are developing a physical vocabulary that will allow them to successfully interact in an adult canine hierarchy. Anyone who has ever watched a nature documentary knows learning life skills doesn’t have to be drudgery. The Middleton-Cross Plains Area School District’s new charter school is applying a related philosophy to people, specifically to students who struggle in a traditional high school classroom. It’s called “project-based” learning and it allows teenagers to research things about which they are passionate. A semester into the experiment, many students say the spark has been ignited, and they are learning – and enjoying it – in ways they never did before. When Clark Street Community School, which was formerly Middleton Alternative Senior High (MASH), opened its doors in the fall of 2012, it had a lengthy description and well-established goals. Educators, many of whom crafted and polished the charter, said it would help students who learn best outside the traditional high school model, using project-based learning to equip students with the skills they need to succeed in the real world. Over the past few months, those ideas have transformed from a thick proposal sitting before the Middleton-Cross Plains Area Board of Education into principles that guide the day-to-day education of 120 students. While public perception of MASH was that the school catered exclusively to “at-risk” teens, Clark Street is intended to serve a diverse student population. The one thing they have in common, at least in theory, is that they learn better at Clark Street than they would across the parking lot at Middleton High School. That ownership, according to Messer, is a source of “great pride” for pupils. “I love that they get to teach what they learn,” she said. Taylor said project-based learning makes him feel like his opinion “matters,” because he is allowed to help determine which topics he’ll study. Some students arrive at school with research projects they want to pursue. Others brainstorm after engaging in classroom seminars with their teachers. Then, as individuals or as teams, the students write their proposals. Breonna Hawkins, 16, recently completed a research project about animal cruelty - specifically animal testing in laboratories. “I didn’t really know much about it when I picked [the topic],” she said, “but I wear makeup and stuff so I wanted to learn how to prevent it.” Students too young to remember a world without Facebook, YouTube or Twitter find themselves doing homework in real time, using conventional books as well as digital information caches. Hawkins was able to find authentic video footage of animal cruelty posted online by animal rights advocates. She said the project changed her perception of the issue, as well as the type of makeup she wears. 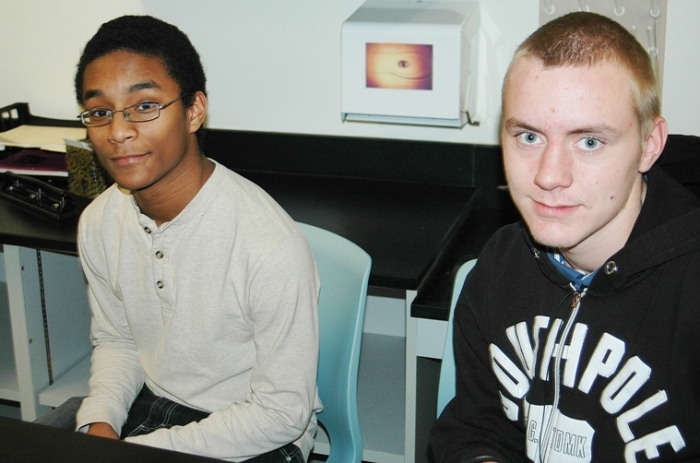 Taylor and Hawkins, both of whom are black, worked together on a project researching blood diamonds. Their research led them to contemplate grim realities about life in Sierra Leone. Messer said the project prompted Hawkins to seriously contemplate her own identity as an African American. And students didn’t simply learn about the plight of blood diamonds and child soldiers in Sierra Leone; they took action, working with a group that is currently building a community center there. Messer said in many cases these projects are holding students’ interest, preparing them to be contributing members of society. She added that not everyone succeeds, and graduates of Clark Street leave with legitimate transcripts, just like their counterparts at Middleton High School. Applications for Clark Street Community School are available on the school’s web page: www.clarkstreetcommunityschool.com and are due Friday, February 1, 2013 at 3 p.m. At this time, CSCS is only open to students in the Middleton - Cross Plains Area School District. Students from outside the school district are welcome to apply to MCPASD during the open enrollment window.